The Chandler Limited TG2-500 pre-amp is a recreation of the rare EMI TG12428 pre amp used in EMI/Abbey Road Studios recording and mastering consoles from the late 60s and early 70s. The sound of the EMI/Abbey Road Studios equipment is world renowned, and imparts a unique and pleasing sonic character as heard on many famous recordings done at Abbey Road including The Beatles Abbey Road and Pink Floyds Dark Side of the Moon albums. For the first time ever, the legendary TG2 pre-amp sound is available in 500 Series format. The TG2-500 microphone pre-amplifier features the same discrete, transformer-balanced amplifiers as Chandler Limiteds TG series: TG2 Pre Amp/DI, TG Channel MKII, and TG1 Limiter. Weve taken the microphone pre-amplifier and line amplifier from our highly acclaimed TG2 Pre Amp/DI and packaged it for the industry standard 500 Series format, while retaining the sound of Chandler Limiteds TG2 Pre Amp/DI. The aural quality has often been characterized as a creamy, smooth tone with a surprisingly open, clear top-end. The sound, as explained by many users, has warmth and punch, but with a beautiful expanded top end. In fact, the TG2-500 microphone preamplifier does have a small rise in its top-end frequency response and some warmth inducing distortion, which contributes to its sound. Bring the sound of the Chandler Limited TG2-500 pre amp and EMI/Abbey Road Studios home to your 500 Series rack today. Abbey Road Studios, EMI and TG and their associated logos are trade marks of EMI (IP) Limited. 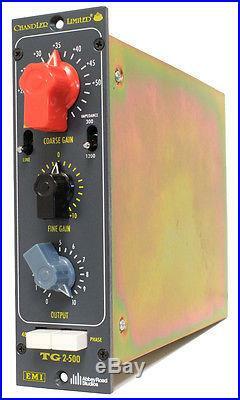 The item "Chandler Limited TG2-500 Mic Preamp / DI" is in sale since Tuesday, November 01, 2016. This item is in the category "Musical Instruments & Gear\Pro Audio Equipment\Preamps & Channel Strips". The seller is "lunchboxaudio" and is located in Seattle, Washington. This item can be shipped worldwide.